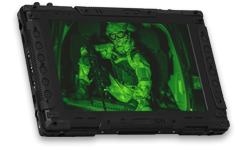 Q-Vio offers a wide range of both custom and commercial-off-the shelf (COTS) LCD display products for government, defense and military applications. We design and build our displays to meet the rugged, high demands of 24/7 military usage. They are available in a wide variety of sizes from 4.1″ to 24″ LCD displays, numerous configurations and options, easily customized to meet specific application needs. Q-Vio’s engineering expertise combined with the latest in display technology result in superior high bright LCD display products that offer rugged construction, excellent image quality, outstanding thermal management, low power and an extended product life cycle. Sunlight Readable LCD Display solutions. for virtually any application where outdoor, direct sunlight viewing is required. Military Laptop Display Systems. Rugged displays, rugged tablets, ground control station displays, shipboard marine LCD monitors, cockpit monitors and more. Dual-mode NVIS Solutions. Compliant with Mil Std 3009 NVIS Class A and Class B. Class leading image quality in high bright day mode along with full compliance with Mil Standard 3009 for NVIS class A or B night mode. Upgrades to Your Existing Product. When maintaining the current system display footprint is preferred or required, Q-Vio can enhance brightness, color contrast and uniformity to your existing display. Quick Prototype Turnaround. Our engineering team can provide custom prototypes in a matter of weeks for the initial test and evaluation. A Variety of Cover Glass Options. Ranging from touch screens, AR, AG, smudge resistant coatings along with several ruggedized protective glass coatings including GGorilla lass. Video Controller Solutions. These will allow you to interface your system directly to the Q-Vio designed display module. Q-Vio designed Programmable, LED Driver Boards. Our high quality LED driver boards offer wide dimming range for precise control of backlight intensity in all display environments.